Posted on August 19, 2018. Filed under Association News. Be the first to comment. 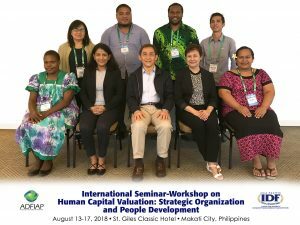 ADFIAP’s Asia-Pacific Institute of Development Finance (IDF) held an international seminar-workshop on “Human Capital Valuation: Strategic Organization & People Development” on August 13-17, 2018 at the St. Giles Hotel in Makati City, Metro Manila, Philippines. The event was attended by ADFIAP members from the Federated States of Micronesia, Samoa, Vanuatu, and the Philippines. 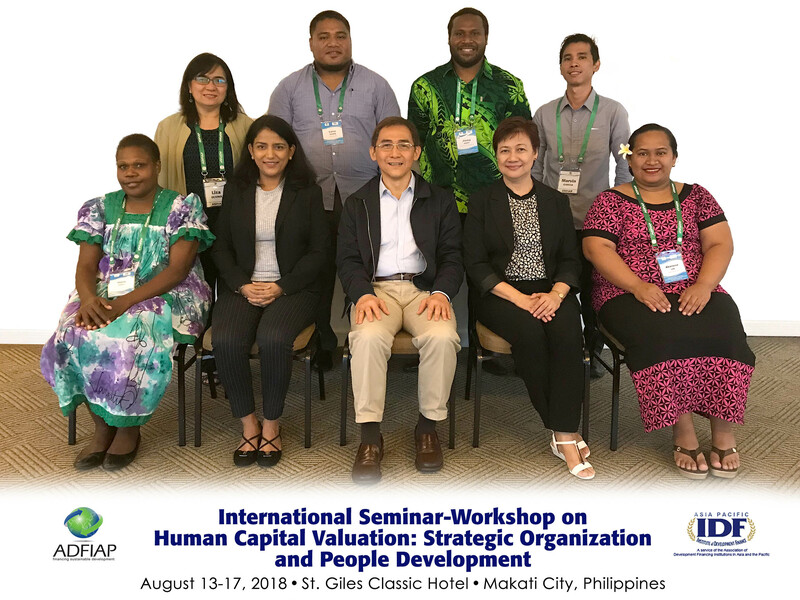 This 5-day event was designed to equip the participants with knowledge, tools and techniques in harnessing people as human capital through strategic organization and people development. It was also aimed at enriching their understanding on the Bank’s mandate from the Board and CEO perspective as well as help them on the interpretation and computation of the Human Capital Value Added (HCVA) and Human Capital Return on Investment (HCRoI) data. In addition, the course guided the participants in the strategic planning of their organization and people development, and the calibration of their programs and projects, processes and systems, to bring about HCVA and HCRoI within each institution’s strategic time and mind frame. Topics covered during the seminar included: measurement of value-added and ROI of human capital; headcount and people investment translated into revenue and profit; planning and budgeting organization and people development for execution of the banks and other financial institutions mandate in a financially sustainable way; understanding development finance institutions (DFI)/national development bank (NDB) mandate from board and CEO perspective; aligning organization and people development to DFI/NDB mandate; structuring a mission-ready and productive organization for operationalizing and realizing DFI/ NDB mandate; helping DFI/ NDB make business excellence a routine; leveraging human resource as capital for realizing DFI/ NDB mandate. The course’s resource person, Mr. Efren L. Elane, has more than 34 years of experience in organization and people development, and currently holds a Senior Certified Professional (SCP) status from Society of Human Resource Management (SHRM) based in Virginia, USA, which boasts of 275,000 members globally. Mr. Elane is also a subject matter expert of SHRM. He was awarded as among the 100 Most Influential Global HR Professionals by CHRO Asia during the 2016 World HR Forum in Mumbai, India.